This weekend we participated in the "Paint Your Pet" Event at Art on the Brix in Golden, CO. It was a lot of fun and the pictures turned out pretty good. We could only do 3 dogs - so we have to return to paint Gracie and Dudley. Shelly brought us joy for 7 months after her rescue. Her kidneys were damaged, so we were fighting a losing battle. She was happy and exuberant for the majority of her time with us. She helped Gracie gain confidence and learn how to seek attention. She would want us to remember her smiling face and silly antics. 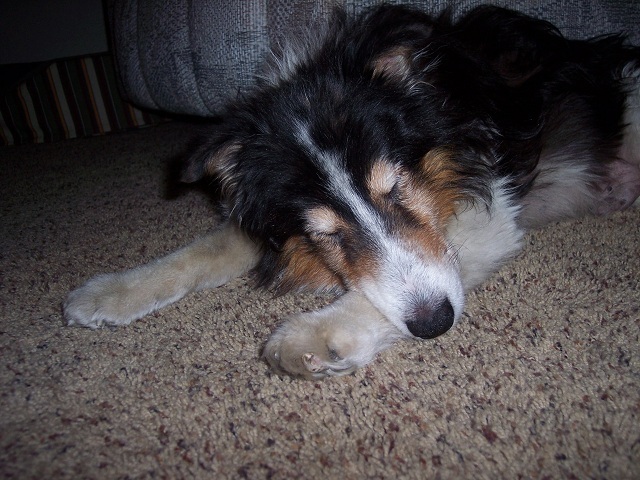 I found this photo of my first sheltie. This was Duke and he was a wonderful dog. Shelly is my yard buddy. Where ever I am, she wants to be. While checking out the sprinklers, we discovered she likes to bounce in the sprinklers. She has a bit of a grey muzzle and some arthritis in her legs - but she doesn't seem 12 when she is playing like this. What joy there is in the exuberance of a dog! And after the romp, she went inside to dry off. Shelly has lived with us for one month now. She is fitting in nicely and learning some manners like "sit". She is also seeing how much she can get away with. Tonight she professed her love for ham by trying to place her paws on the table since we were ignoring her pleading eyes. She is very sweet and wants to be in whatever room we are in. I've yet to figure out how she wants to play. She's tried to engage me a few times but I don't understand the rules of her game. Maybe we'll have to talk to an animal communicator to see if it can be discerned. She has played with a tennis ball twice. Here she is all groomed up with a bow. Since November 2009, Dudley has brought a happy joy to our house and has been a precious treasure to us. 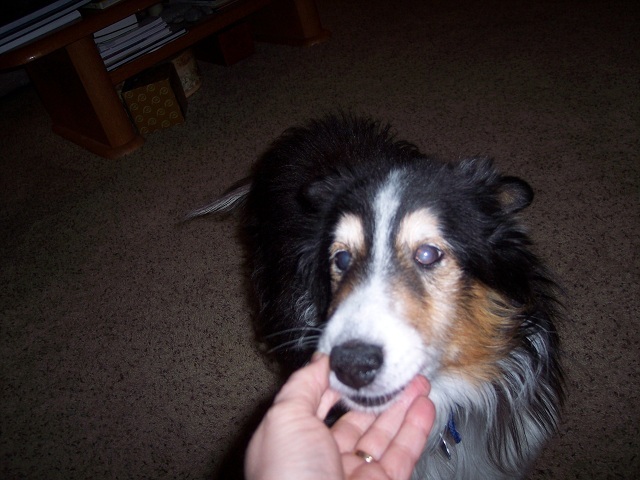 On March 18th, Dudley crossed over to the rainbow bridge. There really aren't enough words to say how much we loved him or how much we now miss him. Whenever we'd go for a walk and get close to the car, he'd hustle his little old legs as if he was afraid of being left behind. I promised him we'd never leave him but I knew one day all too soon, he'd leave us. My dogs seem to come with theme songs and the one that seemed to follow Dudley was "You'll be in my heart" from Disney's Tarzan. I'd sing it to him because I wanted him to know that I'd never forget him. In a "God wink" moment, the song track in my car cd player the night he passed away was "Back to You" by Mercy Me from the Generous Mr. Lovewell cd and the lyrics were perfect for Dudley. Come running back to me my little man. I got this photo from Holly's new mom. 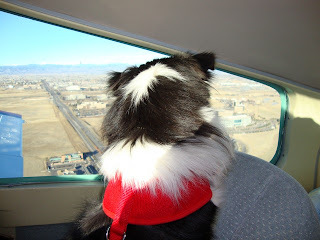 Every person that sees this picture of her flying out of Denver says, "I wonder what was going through her head". I'm guessing she was taking it in stride and marveling at how her life has gone from a Missouri puppy mill dog auction to Denver and now on to sunny Tucson. Ain't life grand! A really great couple applied for Holly and with every conversation, I knew they’d make great parents for her. This was my first fostering experience. It was fun and yet a lot of work. And then there is the letting go. I’m going to miss that little nut and while part of me is ready for the house to return to normal – the other part of me is going to find normal so boring. The dog pen won’t block the front door and all the couches can be uncovered since our older fur kids don’t jump up on them. There won’t be tangled leashes as we tried to walk 3 dogs. I won’t have to go see what every thump and crunch is coming from the other room. We won't be awoken an hour before our alarm. Still - the parting is bittersweet. Her new mom pointed me to a nice story with a quote that really resonates with me. Oh my heart: it is broken today because I miss him unbearably. Yet I continue to remind myself as experience has taught me that soon it will form to be a scar … and now the departure scar on my heart will show that I too belonged and was cared for very deeply otherwise the wound that produced that scar would have never happened. I am so thankful for my scar soon-to-come because it means that we took the time to make that difference to each other and in this I find peace. 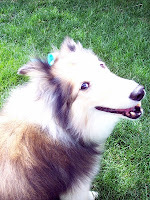 I was thinking about how lucky Holly was that the Pueblo Collie Sheltie Rescue saved her (and 3 others) off the Missouri dog auction. Where would she have ended up? 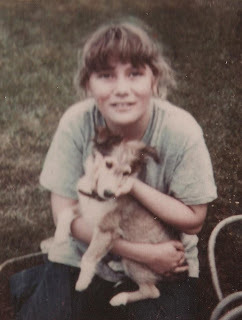 She was a young female destined for producing litters of puppies but she was saved and managed to make it out undamaged. She made it out with her spirit, her teeth, and her personality. Now she is getting closer to finding a forever family, showered with love. Who knows whose lives she will touch? In the meantime, she is keeping us entertained. I have two videos, one I call “insane mode” where she displays her unique style of chasing a ball and then another of her watching herself in the video at my computer desk. She is a nut. December began with the addition of 2 foster dogs. January begins with the adoption of Noel. Noel found the perfect forever home. Now Holly is enjoying all the puppy attention but she hasn’t had any luck in getting Gracie or Dudley to play with her. She enjoys sleeping on the couch. She is a nut but we love her. She went for her 1st walk the other day and enjoyed all the sights and smells. 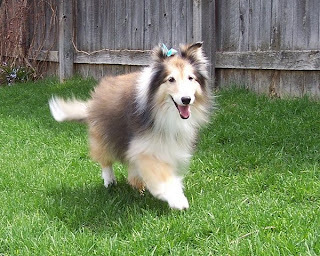 She walks with a bouncy trademark Sheltie swish. Here is a fun Jib Jab video I made to say Happy New Year. Enjoy!